The main characters of Carter Evans are Jeremy Carter and John Evans. They get a lot of help from all those at NDC Timber Inc., as they still work for NDC and most of the wood used in their projects came from NDC projects. The equipment used to work with the wood, the land and buildings are all NDC owned. Jeremy (left) has grown up in a logging – construction environment thus providing the training grounds for running machinery, hand tools, learning all about hard work, getting to see nature at its best and be part of it on a regular basis. Jeremy has no inhabitions and so can jump right into a project, large or small, cutting, sanding and finishing and turning out some very organic art in the process. 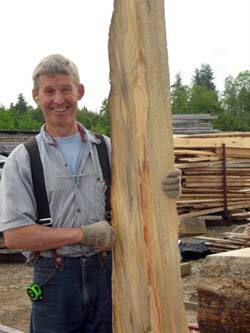 John (right) is a forest engineer working in the timber industry for over 30 years. He has worked in many different conditions, seeing forests, streams and nature in its rawness. 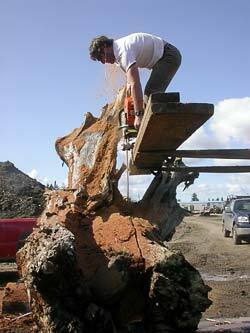 This appreciation led to the salvaging and collecting interesting pieces during regular logging activities. Help and ideas from many peers, trial and error have brought the concept of Carter Evans to what it is today… always changing.